At this point, we’ve spent a long time waiting for Yoshi’s Crafted World. Announced during E3 2017 alongside Kirby Star Allies with a simple ‘2018’ for a release date, we’ve had to wait until March 2019 for the game to launch. The good thing is that Yoshi’s Crafted World is a great title that was worth the wait. 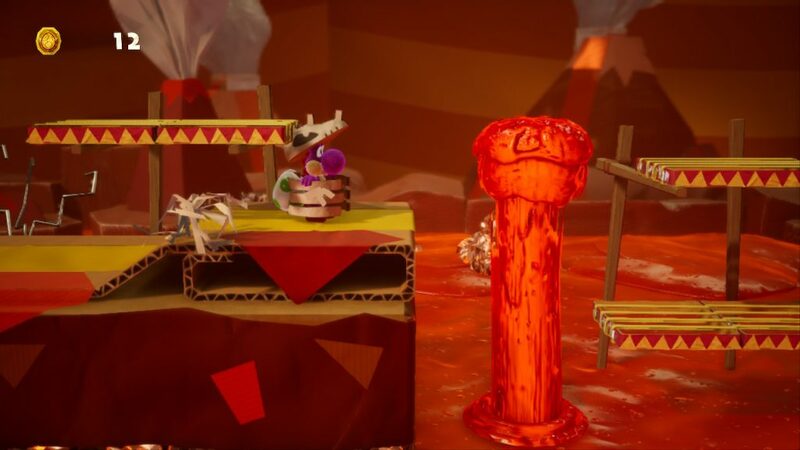 Yoshi’s Crafted World opens with a group of Yoshis relaxing on their island, with the wish granting Sundream Stone sitting upon it. One day, in typical form, Baby Bowser gets it into his head to use the Sundream Stone to grant his wildest dreams, and along with help from Kamek, attempts to steal it. During his daring raid, the Sundream Stone’s gems are sent flying across the world, leaving Yoshi to race to get to the stones before his adversaries. Beyond cutscenes before each boss battle, this is the most story you’ll get from the game, with its only purpose to provide the slightest of threads to push you through the world. I long for the day that Nintendo implements a more in-depth story into its 2D platformers and would have loved to see more here. The game’s soundtrack complements the story, with an inobtrusive style that is simple and relatively sparse. Its light tones never really pull your attention away from the game, but they’re also not particularly memorable and largely get lost. You’d be hard pressed not to notice complaints about the lack of difficulty in the Yoshi games whenever the series is mentioned, and while Yoshi’s Crafted World definitely begins like another mellow experience it ramps up in difficulty the further you get. By the later levels of the game I was having to nail pinpoint platforming and avoid enemies that could wipe out masses of my health, all while trying to explore stages for collectibles. 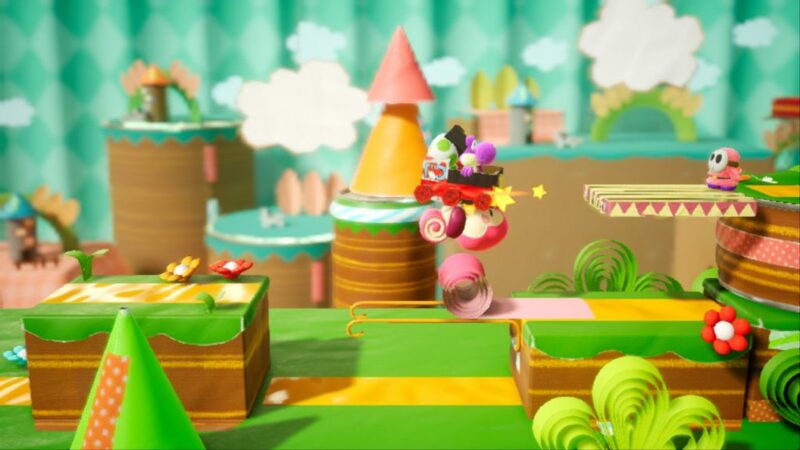 There’s no doubt that Yoshi’s Crafted World is easier than a traditional 2D Mario or Donkey Kong platformer, but don’t go in expecting a cakewalk. Even with the game’s Mellow Mode enabled – which reduces damage and allows Yoshi to very slowly fly – it’s still entirely possible to hit a game over screen. However, the floaty style to Yoshi’s jumps aren’t for everyone and the 360-degree egg shooting doesn’t always work quite as intended, with other targets incorrectly getting picked up in time-sensitive situations causing frustration. As they say, variety is the spice of life, and this is where Yoshi’s Crafted World truly shines. No two Islands are the same in the game, with each having a unique visual style, different combinations of enemies and unique stage types. The game regularly jumps from a regular stage, to auto scrolling score-based egg shooting levels and even more unique levels like a race or a mech-suit level. Knowing that any level could be completely different from the last kept the game fresh and interesting all the way through. While the content is quite varied, completing each level once will take under 6 hours, but they can be replayed in new ways afterwards giving you more to do. The customisation options are great as well, with the game allowing you to choose your preferred coloured Yoshi, as well as featuring a massive number of costumes (which give you armour in levels) to unlock. Seeing Yoshi dressed up as a train, a piranha plant, a solar powered car and more was incredibly charming and endearing. 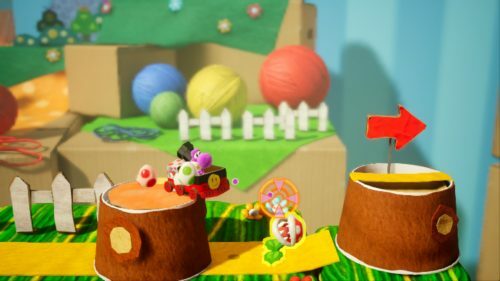 Throughout this variety, Yoshi’s Crafted World has an interesting craft-based art style that is reminiscent of LittleBigPlanet. Evolving from the yarn-based art style of Yoshi’s Woolly World, Crafted World pulls together a myriad of different textures and mediums to create a hodge podge of items that still manage to stay cohesive. 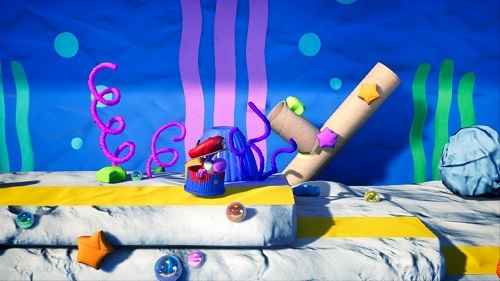 You have platforms made from impassable corrugated cardboard, enemies wearing paper cups as armour and the game’s story cutscenes are presented in stop-motion animation. 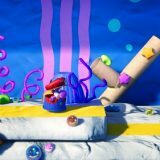 It’s fun to look at and is certainly unique, but Yoshi’s Crafted World isn’t without any graphical foibles. Yoshi’s felt texture looks off, almost like it’s a bit blurry, and the game features its fair share of jagged edges. It would have been nice to see Nintendo and Good Feel implement some anti-aliasing to help with the edges. 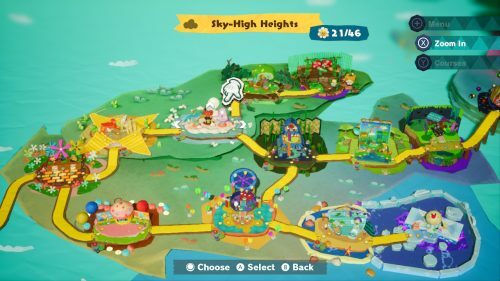 It was a long, long wait for Yoshi’s Crafted World, and while it isn’t perfect, it’s a great exploration-based platformer. Its fun art style, varied level design and bevy of customisation options are fantastic, even if it’s short and has a forgettable story and soundtrack. 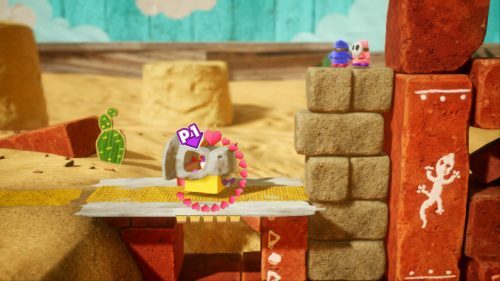 If you’re looking for a new platformer, you should definitely jump on Yoshi’s Crafted World.